Spring Styles have arrived at Please Mum, and you can get a deal now! 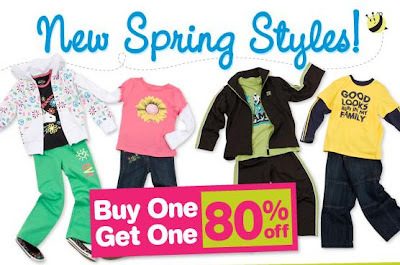 Buy one get one at 80% off on all of Please Mum's new spring styles! Plus you can get an extra 10% off when you purchase $60 online, just use code FRIEND2010. The code expires January 18, 2010. There are still clearance items available, at up to 70% off! All this and FREE standard shipping to anywhere in Canada. Shop Please Mum at www.PleaseMum.com! 0 Response to "Please Mum Spring Styles BOGO at 80% Off, Plus Extra 10% Off with Code, AND Free Shipping"